We are all familiar with the Cursillo tripod of piety, study and action, or under its new nomenclature, of holiness, formation and evangelization. Whatever we call its three legs, the tripod remains a mechanical model, incapable of showing relationships between the three legs. However, the article, “Recapturing the Vision of the Cursillo Founders.” introduced a new perception of the Cursillo tripod. We now see the Cursillo tripod as a dynamic model, a dynamic process, depicting the dynamic reality of the evangelization process. Therefore, we are calling the Cursillo tripod our Evangelization Model. By perceiving our Evangelization Model as a dynamic process, we see the relationships between holiness, formation and evangelization and how they interact with one another. In general, our growth in holiness drives us to focus our efforts on formation, which is our on-going search for ways to deepen our holiness. Together, our holiness and formation drive us to share the Good News with others. And in the process of sharing the Good News with others, we deepen our own faith experiences and are formed by our evangelization of others. What does this dynamic model tell us about our Cursillo spirituality? First, it tells us that evangelization determines the nature of our holiness or spirituality. Everyone is called to holiness, but there are different types. Our holiness is not a monastic holiness. The goal of our holiness is to evangelize society and bring Christ into society’s institutions. So, we are called to be contemplatives in action. Second, evangelization is the fruit of our growth in holiness and our efforts at formation. You will know them by their fruits. The energy of a vital spirituality must flow into evangelization and mission that include social concerns, justice and charity to all persons without limit of human boundary. Third, matters such as social and justice issues demanding evangelization will also dictate in part the nature of our formation. Fourth, and most importantly, when we evangelize others, we evangelize ourselves most of all. In the middle of our evangelization activities, we discover new spiritual insights, we find more courage to act and to lead, we commit ourselves more deeply to Christ’s mission, we become more aware of the Spirit’s presence and empowerment. Evangelization becomes holiness in action. Evangelization becomes the practice of Cursillo virtues. Evangelization transforms us into contemplatives in action. Fifth, the evangelization process begins with our efforts to grow in holiness. Our holiness is the first and foremost element. Our holiness is the fire that gets the process going. There is no formation or evangelization until we have a burning desire to deepen our relationship with Christ’s Spirit. When desire enters our hearts, we look to spiritual formation for ways to deepen our holiness, our relationship with the Spirit. Sixth, formation is subservient to our search for holiness. Our holiness even dictates the type of formation that we require. Normally, we think of formation as an activity that we run: we decide what spiritual books to read or practices that we will perform. However, if we think of holiness as our relationship with the Spirit, we should allow the Spirit to guide us to the formation that we need to grow in holiness. So, we should pray for guidance and make decisions about our spiritual formation during prayer. 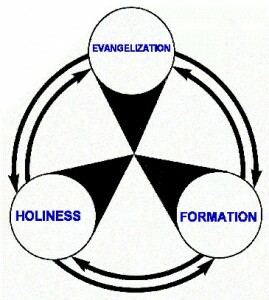 Lastly, we need to see formation as adding fuel to the fires of our holiness. We are not seeking to be theologians. We are seeking to be contemplatives in action or saints and apostles. Our formation efforts must contribute to that goal.